60 Minutes $50 Skin Blends© products and essential oils are mixed especially for your skin care needs. Includes cleanse, triple enzyme exfoliate, steam, replenishing mask and hot towels to improve skin health. A moisturizing massage pampers and soothes. Customized to nourish and rehydrate all skin types. Restores your skin to its natural glow. * Recommended for monthly maintenance. 60 Minutes $75 Purifying facial targeting particular aspects of youthful skin. Includes skin care instruction and custom blended product samples for home care use. 1 Hour $50 Specialty blends deep clean, tone and condition your skin. Also includes steamed towels, mask, and a soothing face and neck massage to release stress. * Please refrain from shaving for at least one hour prior to treatment. 45 Minutes $45 Treat this often neglected part of the body to a deep cleanse, steamy exfoliation treatment, mask and soothing hydration application. Call for pricing 1/4" of growth is required for best results. 60 Minutes $75 Experience the therapeutic benefits of our intensive full-body treatments. Each wrap begins with exfoliation, then a warm sauna prepares your skin. You'll choose the wrap to be applied, then relax bundled in a blanket to seal in warmth. The treatments end with a cool down rinse and a luxurious lotion application. You'll feel the heat with this signature body treatment. Infused muslin sheets envelope your body with our own unique blend of select herbs, essential oils and organic jojoba. Promotes muscular relaxation, eliminates toxins and restores hydration. Cocooned in warmth, the mud's healing plant extracts and trace elements are absorbed into the skin. Draws out impurities and stimulates circulation. Leaves you feeling energized from head to toe. This nourishing blend combines sea kelp extract for metabolic stimulation and Klamath Lake algae to hydrate and detoxify. Rich in vitamins, minerals, aloe vera and lavender, your skin will feel smooth and supple. A full body exfoliation. This gentle bamboo & raspberry scrub draws out toxins and tones the skin. High in antioxidants. Leaves your skin nourished and velvety smooth. Gentle long soothing strokes promote relaxation and rejuvenation. Relief for tight muscles and joint pain. Releases tension and detoxifies. A variety of techniques combined to your needs. Balances energy and alleviates fatigue. For centuries people have been drawn to the healing power of heat and the energy of stones. This form of bodywork uses hot basalt stones throughout the massage. This luxurious treatment deeply relaxes your muscles with comforting warmth. An ultimate experience. Our natural hand and foot treatments soothe, nourish and promote relaxation. 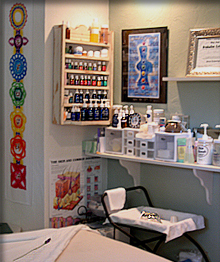 Services include nail shaping, cuticle treatment, exfoliation, massage, and polish. 45 Minutes $22 Softens your hands and beautifies your nails. 60 Minutes $35 A warm foot soak followed by our complete nail care. 20 Minutes $12 Sealed in moisture with a warm and soothing wax dip. Add on service to your manicure or pedicure. 60 Minutes $60 A luxurious rejuvenation for your hands and feet. 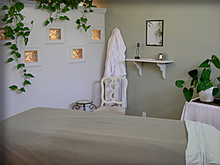 Includes a warm aromatherapy soak, exfoliation, and hydration massage. A parafin dip concludes this soothing experience.